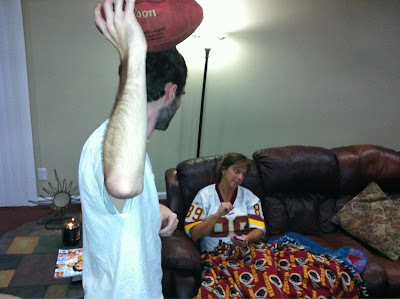 RG3Skins: Move Over Griffining, Josh Morganing Is Here! Move Over Griffining, Josh Morganing Is Here! First there was the huge explosion @Griffining on Twitter...then there was @StopGriffining which has turned into @JoshMorganing. Griffining was "fun" because it was celebrating a Redskins touchdown and a huge victory. Well the Redskins had a rough loss to the Rams on Sunday, and some of the blame goes to Josh Morgan who knocked the Skins out of field goal range when he decided to throw a football at a defender after the play was over in anger. If that's the case, then maybe he should try roller derby. He would be dead tired by then to throw an anger fit after a lost game. Therefore, it is safe to say then that "Morganing" takes out the joy in a good football game.